Minibuses are perfect for transporting people from or to an airport or for smaller groups of people. This is also a good choice for groups coming to an event from different places (for example, people are coming to a concert from different branches of the company). Small minibuses are especially good in places that are harder to reach, like old towns. The journey takes less time but the number of people is also not as big compared to a bus. 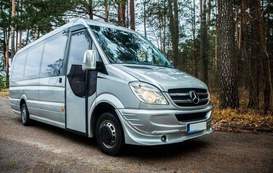 Despite compact our minibuses are comfortable and are made for long and short journeys. Passenger transport is a serious work and only professionals should do it. We have a vast amount of experience in the service, so we can ensure you that our transportation is that of the highest quality. Even the choosiest clients are always left satisfied and it doesn’t matter whether you are a small or a large group of people. Subscribe to our newsletter and stay updated on the latest developments and special offers.